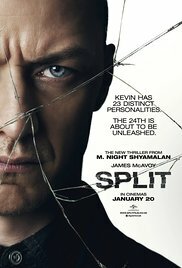 Split is a psychological thriller about a person who goes by many names: Kevin, Dennis, Patricia, Hedwig, Barry and many more (all played by James McAvoy). This is because he has 24 different personalities, each one capable of taking over his body and mind. As seen in the trailers, he abducts three girls, and his personalities have different intentions for them. The ultimate goal of each one of his personalities is to make preparations for unleashing the final 24th personality. The three girls taken are Claire (Haley Lu Richardson), Marcia (Jessica Sula), and Casey (Anya Taylor-Joy). They are three ordinary girls and they are taken to a small room and kept locked inside. Claire suggests that the three of them work together to take down their captor, but Casey doesn't agree. Casey is a girl who keeps to herself and is not like the other two. She wants to study their captor and the situation so they can strike at the right moment. Eventually, all three have to take it slow and plan their escape. We see Casey's past story throughout the film and get more of an explanation as to why the man began to form his personalities. A psychologist by the name of Dr. Karen Fletcher (Betty Buckley) plays an important role in the film and tries to help the situation as best she can. We see a lot of crazy things happen that I will not spoil, but it's a wild ride, trust me. The ending was not what I expected, especially when we see his final personality. M. Night Shyamalan is the director of this film and, if you do not know him, he has directed other films including The Village, Signs, The Sixth Sense, and The Happening, to name a few. He outdoes himself again and this film kept me on the edge of my seat. Not only is this story great, but the acting was superb as well. I can see myself watching this again, and I'm sure you'll walk out enjoying it as well. Don't quite leave right after it's done though, because there is a bonus scene right before the main credits that makes a connection to a different Shyamalan film, and a famous actor in one of Shyamalan's films makes an appearance.